SDS Track™ is a program that is designed to provide an electronic storage database for tracking and managing safety data sheets (SDSs). This section will help guide you through the steps and best practices to set up and begin using the SDS Track application. If you have any questions or need any assistance, please feel free to contact us using the options to the right. All SDS records that are loaded into the primary site of your account will be included in the SDS Library for all secondary sites. We recommend entering all SDS records into the primary site and copying the desired records into secondary sites from the SDS Library for ease of management. You can add records to SDS Track individually or import multiple SDS records at a time. If your provider has uploaded SDS records, then they will be available to copy from the SDS Library in the primary site of your account. Note that GHS information cannot be added through imports at this time. You can extract information from SDS Track through the Reports menu, such as maintaining an offline copy of your SDS records. This is also where users can print hazard labels for substances. 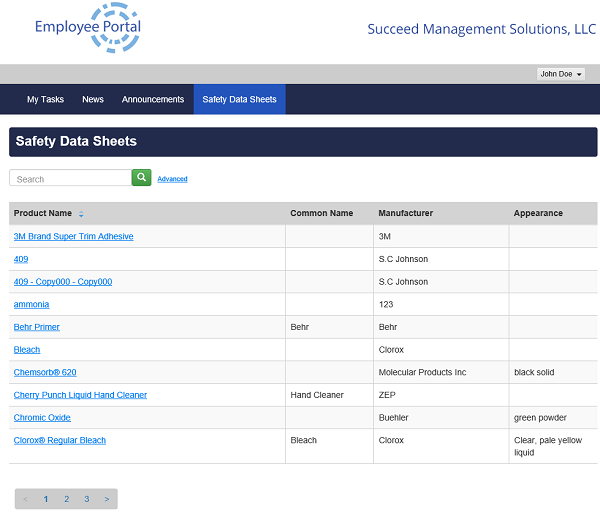 Users can review SDS details and print hazard labels from within SDS Track, but the rest of your employees need access also. The Employee Portal provides read-only access to your SDS records, including the ability to download SDS's and print hazard labels.